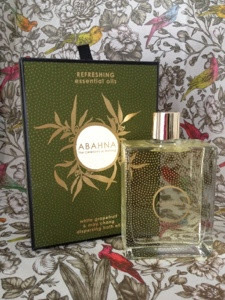 Abahna are a luxury British brand that aim to make our daily shower/bath a special experience. I was recently sent their White Grapefruit and May Chang bath oil* to try, and was pretty much running up the stairs to the bath to try it out after just one sniff. Before I start raving about the oil itself, I need to mention the packaging. The glass bottle of bath oil comes packaged in a beautiful box, which slides open to reveal the oil inside. The bottle itself is etched with a really pretty design and will look great on show in your bathroom. The oil itself is a soft citrus scent - the White Grapefruit is balanced out by the May Chang, so although it's really uplifting, it's not overpowering. I used about 3 small capfuls for a full bath and this fragranced the whole bathroom. I probably wouldn't use this oil right before bed as I found that it woke me up a little, but it's perfect for a Sunday afternoon pampering session. 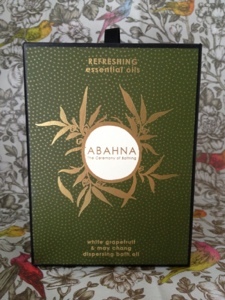 All of Abahna's bath oils are free from any SLS, parabens, and petrochemicals. The scent's are created using essential oils, and are not tested on animals. A 100ml bottle of bath oil retails at £20, which definitely makes it a luxury purchase, but I think that these make a really beautiful present, or just an indulgent treat for yourself. Lilac Rose and Geranium is next on my list to buy! Have you tried anything from Abahna before? I was recently sent some of their items and I cant wait to try them (just need to take pics first) - the packaging is just gorgeous, you are right - the make lovely gifts! Sounds lovely! How does it leave your skin feeling after I've never used bath oils because I worry they will make me feel greesy? Ah this sounds gorgeous, dying to try some bath oils!